← Addicted to Oil? Sharpen your hand tools! 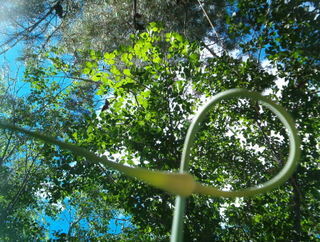 Blue sky, green trees, and the graceful curl of a garlic scape....What? In the desert? How can this be? I have a serious case of scape envy. There. I’ve said it. I have so-called “friends” who send me pictures of their garlic scapes and how well they are doing. Don’t get me wrong. I love to see how the garlic is growing in other parts of the country – especially garlic bulbs that are descendants from our own. It’s just that we have had so much wind and rain and cold here in the Northwest, I can hardly call it “spring.” I am only just beginning to see the tips of these little bulbils emerging on my earliest varieties. Sure, I am getting a few scapes off the elephant garlic, which are always the first to emerge, but it will be awhile before the hardneck varieties offer theirs for the picking. Usually I am harvesting around Memorial Day and into the first week of June. 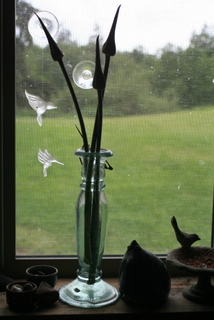 In the meantime, I have been working on compiling my favorite ways of using garlic scapes in the kitchen, which, considering the way I cook (it’s called “fling theory”), is turning into a stream-of-consciousness novella. I am hoping to get this little cookbook finished before scape season is over, but believe me, it has been a drooling undertaking that has only added to my misery. And speaking of scapes – or maybe scallions – I had a good question from a reader the other day who asked how big they can get before they’re too tough to put in a salad or just grill. He had recently purchased some at the farmers’ market that were about ½ inch diameter, and said they were much too tough to eat raw or grilled, but that sliced and sautéed in scrambled eggs, they were great. I am not sure whether he was talking about scapes or scallions, so this is a good time to bring up two things: 1) not all scapes are the same, and 2) the difference between scapes and scallions. Scapes are the shoots that come out of the center of the garlic plant at this time of year and form a little bud on top that later develops into little seedlets (which can be planted or eaten). Only the hardneck varieties produce scapes (actually, the softnecks will, too, but only under duress). 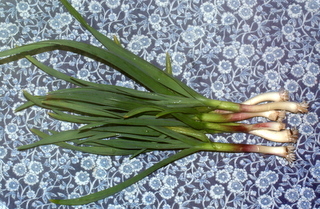 Elephant garlics, which are not a true garlic, but of the leek family, also produce scapes. I was in our local grocery today and saw garlic scapes bundled up with rubber bands like asparagus spears going for about $4/lb. They were tall and straight and a little on the thick side: definitely elephant garlic. The top bulbs were quite large. Obviously older than the ones I had just picked from our garden. The elephants have a much different flavor than do the smaller, more delicate scapes of gourmet hardneck garlic varieties, which often twist and turn in circles, depending on the type. Although the elephants in general are milder than regular gourmet garlic, they also tend to have a slightly bitter flavor. Care must be taken not to cook them at too high a heat, which can bring out that bitterness. Personally, I prefer them in soups and stir fries. In fact, I used some the other night lightly sautéed with some pak choi and a little celery, and it was delicious over cous cous. In general, young scapes from hardneck garlic varieties are better for grilling or eating raw. Even the very curly ones, though, if left on the plant too long, make better floral arrangements. Regardless of the kind, fresh scapes should snap like an asparagus. Old ones get tough and woody. 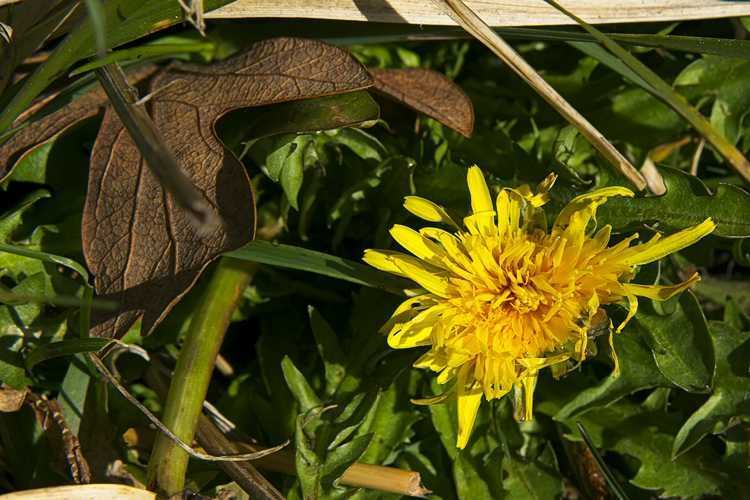 Yes, the flower tips are good to eat, too, but also can get quite tough, depending on when you pick them. The other thing I’m seeing in stores is “green garlic” or “garlic scallions.” These are not scapes. These are just immature garlic plants. They look a whole lot like green onions and are about the same size. They can be either hardneck or softneck varieties, since we’re talking about the whole plant, not just the scape shoot. Elephant garlic scallions, which are often advertised as “green garlic,” are much larger and more like their leeky cousins. You will often see the little nubs starting to form on the bulb that are characteristic of the elephants. These will grow into those hard-shelled corms or bulblets that can be planted and grown into rounds the first year and full-sized elephant bulbs the following year. Hope this answers some of the questions out there about scapes and scallions. Whatever the variety, they are all similar in that they are best when young and tender – and there are so many things you can do with them, I can’t begin to list them in a post – hence, my upcoming cookbook! 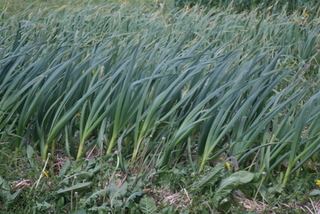 Garlic - against the wind - tougher than you'd think! As for the rest of the veggie garden – it’s kind of a gamble. If I waited until nights are consistently at 55 degrees before planting (as many seed packages suggest), I’d be a long time waiting. Heck. We’re lucky to reach 55 in the heat of the day. As you can see from the status of my tomatoes, I’d probably better stick to garlic. Course, last year, I purchased plants from A New Leaf (which is now housed at the Red Rooster Grocery), and they just about took over the world as I know it – the tomatoes, that is, not Mark & Lisa at the Red Rooster, although they are definitely getting a “buy local” movement going that is doing its part to change the world. Still, I can’t complain. I think about my desert-rat friends trying to grow garlic in what is quickly approaching 100 degrees, and I imagine I would be breaking out in some kind of rash under those conditions. I wish them well and hope that they enjoy those tender scapes while they can, because they are likely to be harvesting their garlic bulbs pre-cooked (which might not be half bad – hmm, they might be on to something there – and if nothing else, time for a neighborhood barbecue!). Hi Greg – I cut mine very close to the top leaf (or I just snap it off). Hope that’s ok. So far, everyone has managed fine with that. One year, I was delivering them to a florist who wanted longer stems, and I cut them below the top leaf. That was NOT a good idea. My bulbs ended up being much smaller. Oh yeah – gently sauteed in EVOO sounds great. A splash of balsamic vinegar or a little lemon juice is also good. Grilled. Slow roasted. Chopped fresh like chives on baked potatoes. Thrown in with pasta. And yes – I have dehydrated the garlic before. 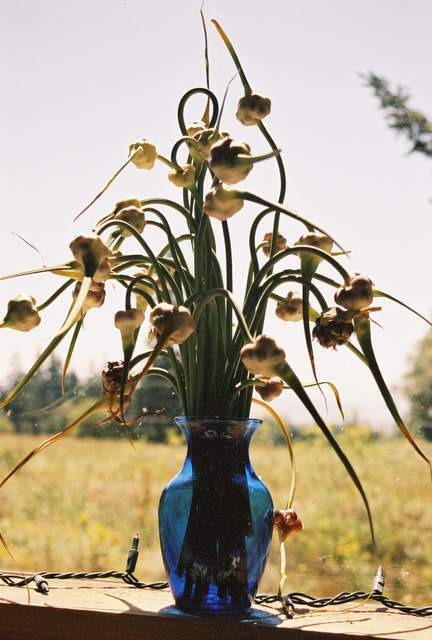 The scapes dry great – as do the cloves. When you’re camping, a little package of dried scapes makes a pretty gourmet meal. During the winter, the dried scapes add a hint of garlic and a remembrance of spring that is quite uplifting, especially during those dreary February days when the rest of the garlic is gone and nice weather seems a long ways away. Pickling the scapes is also a good idea. They freeze well, too. And they keep a good couple of weeks under refrigeration. It’s also very easy to make your own dehydrated garlic from the bulbs. One year, I was frustrated with trying to sell to the fresh market and had trouble finding outlets that were equipped to carry the fresh garlic – and so I dried a lot of garlic cloves – and I do mean lots. The biggest problem was peeling the cloves. I also roasted whole elephant garlic bulbs, blended them in a food processor, and spread the garlic mush on trays to dry, and they were absolutely wonderful. I spent a lot of time fixing up my shop to meet health standards, thinking I could make a bottled product, but I have yet to completely follow through with that process – it’s a long story and best saved for a lengthy post. Ok thanks for the info Blythe. By the way, do you cut them 2″ above the top leaf or higher? I will be cutting some of them tonight and plan on a little treat for the family. Saute in olive oil and a little kosher salt? Have you ever tried to take some of your garlic and dehydrate it? I’ve noticed our garlic scapes are doing quite nice. A majority of them are now curled in a circle and going back upward. Blythe, when do you “pop those tops”? Thanks and again, great reading here. NOW!!! Now is a great time to scarf the scapes! As they mature, they will start to straighten up and get tough and woody. So if you are going to eat them, when they curl is an ideal time to pick them. They are still tender and also big enough to give you more to eat. I have heard of picking them immediately when they start to show, but this might shock the plant into thinking it has to produce another one, which I would think would take a lot of energy. Two trains of thought on scape removal: 1) picking the scape encourages the plant to concentrate its energy on producing a bigger bulb; and 2) not picking the scape allows the plant to harden off as it would naturally, resulting in better storage capabilities. Personally, I have always picked mine (I thought it was a rule), and those I missed did appear to have smaller bulbs. 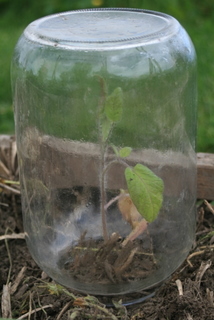 Some claim that if you have really good soil, size won’t be affected either way. In my area, we always lose a certain number of bulbs to molds (a lot of factors can play into this, but a cool, damp climate near the saltwater is a big one) – so storage is important to me. I really hate having to throw garlic away when I’ve spent 9 months trying to grow these little babies. This year, I’m going to do a little experiment. I am going to leave a bunch of scapes on. The obvious benefit is that the little “flower top” (which isn’t really a flower, but looks like one) will produce a bunch of little bulblets, which I can later plant. 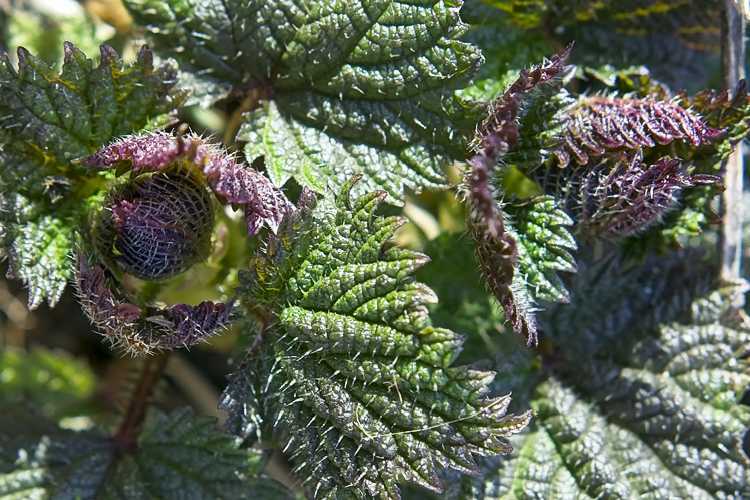 These plants might take a few years to get as large as their parents, but it’s an inexpensive way to increase your seed stock. So if you can restrain yourself from eating them all (or sharing them with your salivating friends), you might want leave a few on, too. Thanks for checking back in, Greg – glad you like the site 🙂 Glad to hear your garlic is doing so well. Where did you see the scapes for sale? I’ve been wanting some! I have liked sauteeing them and we have also brushed them with olive oil and grilled them! Hi Nicole! Sunny Farms is where I saw them at $4/lb – they had them there last year, too, but I can’t remember where they came from. Someone is growing a lot of garlic, tho! I also saw some yesterday at the Red Rooster Grocery in Sequim, which, if you haven’t been there yet, is such a fun little store (located across the back parking lot at Hurricane Coffee, in the old theater building). They are getting new stuff in there all the time. I took them some oregano & mint yesterday. The garlic they have is also elephant garlic (both “green scallion” and scapes) and it comes from the Lazy J and also the person who makes all the worm tea. Mine are just barely coming on – and I didn’t grow very many elephants this year – so it will be another week or so. You might also check the Sequim Locally Grown outlet – go to http://sequim.locallygrown.net – a very easy place to get local produce from several growers at once. Mmmmm…..grilled with olive oil….and brushed lightly with a little balsamic vinegar….yum!